Though very popular and useful, elastic-resistance training is poorly understood. Can elastic-resistance training improve performance? How does elastic-resistance training affect performance? 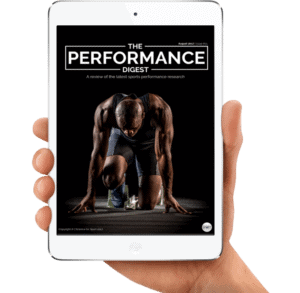 Whilst the use of elastic-resistance training to improve performance has risen in recent years, this training tool has been used in certain sporting environments for decades. 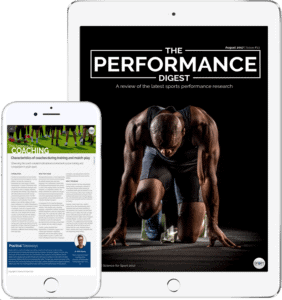 Short-duration training programmes have been repeatedly shown to improve strength and power in both trained and untrained athletes. 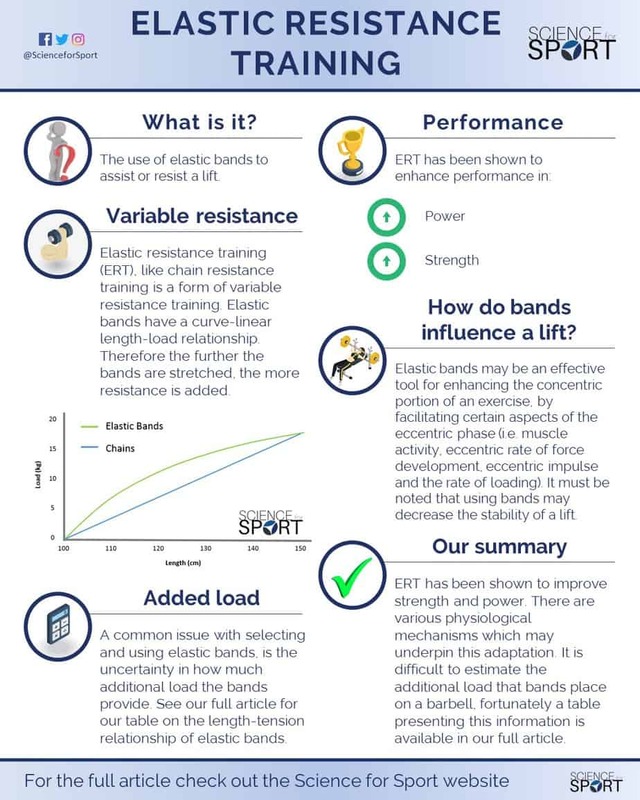 Despite this, the lack of common knowledge regarding ‘how’ elastic bands may actually affect performance and thus enhance these strength and power qualities is alarming. To add to this, because there is uncertainty with how much additional load is applied to the barbell by the bands during an exercise, not only is selecting an appropriate band a difficult task but monitoring the load becomes even more complicated. As a result, Table 1 provides a simple ‘guide’ to the length-tension relationships of a variety of bands and is also downloadable and printable for use in gym facilities. Keywords: length-tension relationship, sticking point, rate of force development, rate of loading, concentric, eccentric, stretch-shortening cycle. When an exercise is supplemented with either bands or chains, it causes a ‘variation’ in the load being lifted throughout the range of movement – hence the name ‘variable resistance training’. At face value, when these tools are used as a resistive force, they increase the load being lifted in a linear fashion. However, their loading patterns are different. Elastic bands exhibit a curvilinear length-load relationship, whilst chains display a much simpler linear relationship (Figure 1) (2). Though training with bands has become very popular, there appears to be a lack of fundamental knowledge in the usefulness and application of this method. For example, how ERT affects force production, and whether or not they can improve maximal strength in untrained and trained individuals. In many cases, ERT is commonly used to improve an athlete’s ability to overcome the “sticking point” of a lift or to increase the force production in the latter stages of the exercise (i.e. the end ranges of motion). Both of which will be discussed in the latter stages of this article as we fragment the characteristics of ERT during the back squat. ERT has been shown to improve maximal strength in the bench press and the back squat after a 7-week programme (3, 4). Furthermore, Anderson et al., (3) reported no increase in muscle cross-sectional area and suggested that these improvements may be related to neural adaptations. Improvements in power have also been recorded when athletes used loads close to 85% of back squat 1-repetition maximum after 7-weeks of training (4). These improvements in power output are also supported by Anderson et al., (3) who reported large increases in average lower-body power, but not upper-body. It is important to note that this article will discuss using elastic bands for resistance purposes and not assistance, unless otherwise stated. For the purpose of discussion, and because a majority of the research has been conducted on it, the back squat with resistive elastic bands will be the example exercise used in this article. During this transition phase, or stretch-shortening cycle (SSC), as elastic-resistance increases muscle activity (5, 6) and rate of loading during the eccentric phase (6), it is often believed that there will be an increase in the storage of elastic energy and thus improvement in the following concentric performance (1). In other words, the assistance of the elastic bands during the descent is thought to load the eccentric-concentric SSC to a greater extent than free-weights alone, and thus improve the following concentric portion of the lift. As a result, it is somewhat rational to assume there may be an increase in the concentric rate of force development (RFD), however, this does not align with the research which suggests that ERT does not improve concentric RFD (4, 7). Having said that, one very important aspect to consider is that both of these authors only measured average RFD, and not peak or any time-interval RFD. As elastic bands slow down the later stages of the concentric movement, using an average RFD may mask any improvements in early-stage RFD (i.e. the RFD at the beginning of the concentric phase). Therefore, ERT may not improve average RFD, but they may improve early-stage RFD, though no research has yet validated this. In support of this, Wallace et al., (4) reported an increase in peak power as a result of using ERT – though they did not identify at which part of the concentric phase they achieved peak power (e.g. early-, mid-, or late-stage). Many strength and conditioning coaches often use ERT to overcome the weakest part of the exercise, otherwise known as the “sticking point”. It is this segment of any exercise that the joint levers are at their weakest position, this, in turn, determines the maximal weight an athlete can lift (3). Continuing from the former point, it is thought that using elastic bands will either improve early-stage RFD and/or alter the mechanical disadvantage of the sticking point (1), therefore improving an athlete’s ability to overcome it. The first of these two reasons (i.e. early-stage RFD) has already been discussed. In order for them to reduce the mechanical disadvantage of the sticking point, the elastic bands must be used as an ‘assistive’ force as opposed to a ‘resistive’ one. This means using the bands to make the concentric part of the lift easier, not harder, by simply placing them above the barbell instead of below. In this instance, it is believed that the bands offer a degree of unloading and may assist the acceleration of the barbell – helping the athlete overcome the sticking point (8). Though this is often a common thought, to the best of our knowledge, no scientific evidence supports this theory. To further support this, as long-term ERT has been shown to improve maximal strength, then it may be suggested that they facilitate maximal strengths gains, and resultantly help overcome the sticking point (1). The length-load profile of elastic bands means that with an increase in the stretch-length, there is an increase in the tension of the band to resist that stretch (Figure 2). In other words, the more the band is stretched, the higher its resistance to stretch becomes. Because of this, coaches often use elastic bands to increase an athlete’s strength at the end range of the movement (i.e. the top portion of the exercise), as this is where the bands provide the largest resistance. It is often argued that the increase in resistance towards the end range of movement (ROM) will increase the neuromuscular demand, and thus elicit a higher force production (1). Theoretically, a higher force production equals an increased likelihood of strength gains. In fact, Wallace at al., (4) found that trained athletes produced both higher peak force, and higher peak power when using bands rather than free-weights alone. However, this is not always the case as the actuality behind it is far more complex (9, 1). It has been suggested that force production throughout the concentric portion of an exercise may actually be reduced, at least in weaker or untrained athletes, as the variable resistance of the elastic bands causes larger oscillations (i.e. movements/trembling), and thus requires a higher degree of stabilisation (1). The idea that elastic bands increase the agonist-antagonist co-contraction would also be supported by this theory as they work to achieve a higher degree of stability. As a result, the variable load of the elastic bands may increase the need for stabilisation, and thus reduce an athlete’s ability to produce force. In theory, this may affect athletes with less training experience and/or strength than more experienced and stronger athletes. This, therefore, questions the need for an optimal level of stability as a pre-requisite for improving maximal strength when using elastic bands. Having said that, it is important to understand that no empirical research has been conducted on this concept. Lastly, the stability demands of elastic bands suggest they may act as an effective tool for rehabilitation. During the eccentric phase of an exercise, the elastic bands are attempting to recoil, and thus providing an assistive downward force. Two studies have shown an increase in muscle activity during the eccentric phase of different exercises when using elastic bands (5, 6). The increase in muscle activity may increase the rate of loading during the eccentric-concentric SSC, including the eccentric RFD and the eccentric impulse. In fact, one study has shown an increase in eccentric RFD and eccentric impulse as a result of using elastic bands during the eccentric phase of an exercise (6). Higher eccentric RFD has been repeatedly linked with better jump performances (6, 10), and has even been suggested to be a better predictor of jump performance than concentric RFD (10). In addition, the eccentric impulse has also been determined to be one of the vital components of vertical jump performance (11). All in all, elastic bands may be an effective tool for enhancing the concentric portion of an exercise by facilitating certain aspects of the eccentric phase (i.e. muscle activity, eccentric RFD, eccentric impulse, and the rate of loading). It is simply the recoil of the elastic bands which may enhance these aspects of the eccentric phase, as it provides an assistive/accelerative component to the barbell. 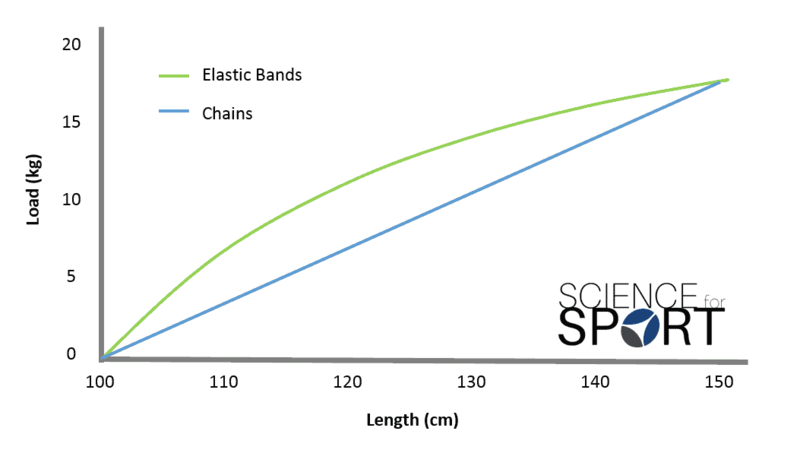 A common issue when selecting and using elastic bands is the uncertainty in how much additional load the bands provide during an exercise – otherwise known as the length-tension relationship. This relationship purely describes how much tension (i.e. load) is provided when the band(s) is stretched to a particular length. Luckily, one study attempted to measure this and provide some degree of clarity to this issue (2). Table 1 provides a clear representation of the amount of weight added when the bands are stretched to a particular length. The information is based on bands that are 100cm (1m) in length at rest (i.e. non-stretched), and their relative tensions for every 10cm of the stretch until they were deformed to 150% of their resting length (150cm). Whilst this table provides a great degree of clarity, it is important to note that not every band in the World will produce the exact same length-tension relationships. This means that the actual load may, and most likely will, vary between each band. Still, this table provides a higher degree of clarity than any of the guesswork which is currently present within the industry. As a consequence, a variation of this table can be printed and placed on the gym wall as a guide to the length-tension relationship of elastic bands (see above). Effects of ERT on various force production variables (e.g. peak force and RFD) in both trained and untrained athletes. The degree of oscillations and its impact on stabilisation. Changes in early-, mid-, and late-stage RFD as a result of using elastic bands. Length-tension relationships of different bands during a variety of exercises (e.g. bench press, squat, deadlift). EMG activity during various exercises and under different loads. Training programmes using elastic bands have been shown to improve maximal strength and power after 7-weeks. Elastic bands produce a curvilinear length-tension profile. Elastic bands have been shown to increase eccentric muscle activity, eccentric RFD, and eccentric impulse. ERT has not been shown to improve average concentric RFD but may improve early-stage concentric RFD. Using ERT may improve an athletes ability to overcome the sticking point. The variable load induced by elastic bands appears to require greater stabilisation and may, therefore, reduce peak force production. This may be exacerbated in athletes with minimal training experience. Table 1 is printable and can be used in gyms as a practical guide to the length-tension relationships between a variety of elastic bands. Strength and conditioning entails many, many topics. By choosing to simply read up on Elastic-Resistance Training and ignore the sea of other crucial S&C topics, you run the risk of being detrimental to your athlete’s success and not realising your full potential. 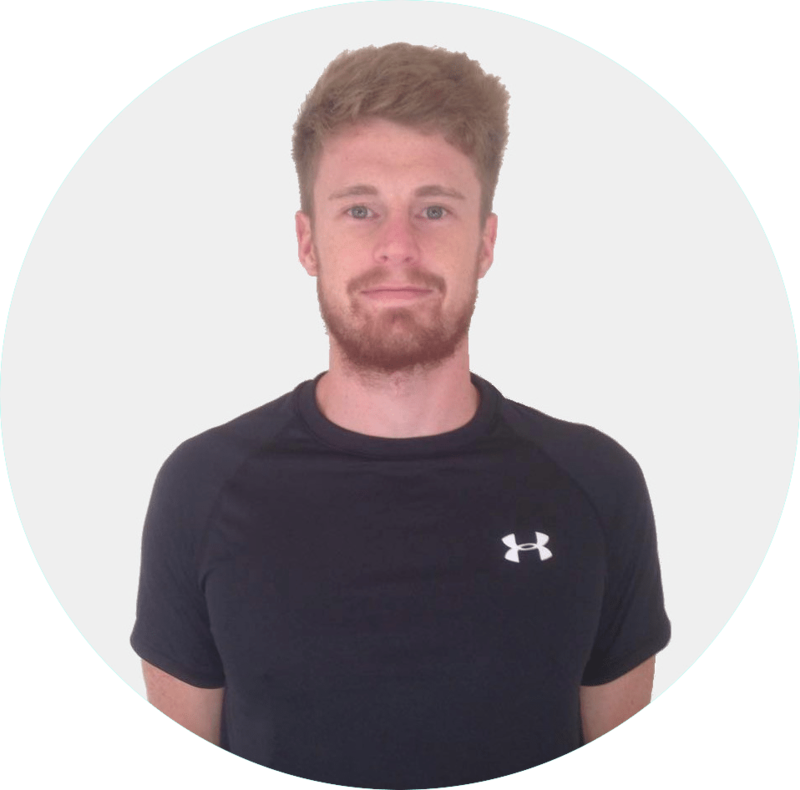 To make you an expert coach and make your life as easy as possible, we highly suggest you now check out this article on Plyometric Training. Newton, RU, Robertson, M, Dugan, E, Hanson, C, Cecil, J, Gerber, A, Hill, J, and Schwier, L. Heavy elastic bands alter force, velocity, and power output during back squat lift. J Strength Cond Res 16: 13, 2002.